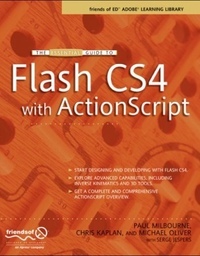 The Essential Guide to Flash with ActionScript is the most complete guide to all that’s new, powerful, and dynamic for the experienced Flash developer. Chock full of need-to-know techniques for getting the coolest Web sites designed, up, and running as efficiently as possible. Adobe’s Flash has become the most ubiquitous tool ever created for Web professionals and the latest version is a must-have upgrade for everyone using Flash. This is the one book to have for getting Flash things done!